Aberporth VillageThe village lies at the southern end of Cardigan Bay about six miles north of Cardigan and ten miles south of New Quay. 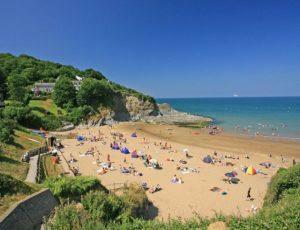 Aberporth is a popular recreational fishing village in the summer and is also popular with divers and boating people. It has two good beaches and Dolwen has been awarded a Blue Flag. The picturesque village overlooks two sandy beaches and is one of Ceredigion's favourite holiday destinations, proving popular with tourists throughout western Europe. Rock pools are exposed at low tides and the cliff top walks along the Ceredigion Coast offer extensive views. Bottlenose dolphins are seen frequently close to shore, with rare sightings of orcas and harbour porpoises. Sunfish and basking sharks are often seen offshore in the summer. In the 16th century, Aberporth was a subsidiary landing point for the port of Cardigan. Boats, nets and salt for preserving were brought in from Ireland. It developed rapidly in the late 17th and early 18th centuries as local people began to take part in the maritime trade. It became a very active port with the northernmost of the two beaches extending into the river valley and provided a safe anchorage. Limekilns, coalyards and warehouses were built on its south shore. The village lies at the southern end of Cardigan Bay about six miles north of Cardigan and ten miles south of New Quay. 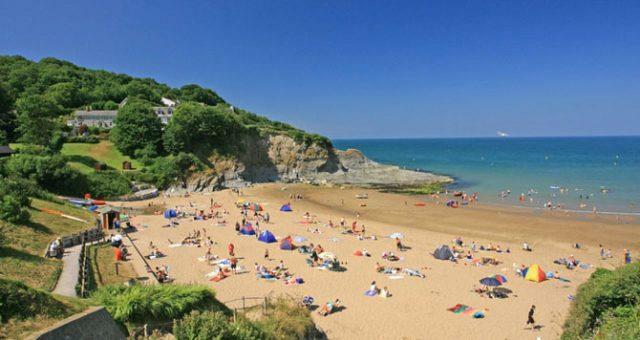 Aberporth is a popular recreational fishing village in the summer and is also popular with divers and boating people. It has two good beaches and Dolwen has been awarded a Blue Flag. Aberporth developed into one of the main centres of the herring fishing industry in Wales. Drifting and netting were both employed and at one time at least 20 full time herring smacks, a type of traditional fishing boat, went to sea regularly. The industry persisted until the beginning of the First World War when fish stocks declined. Crab and lobster fishing continues on a small scale to this day. Off the A487 between Cardigan and Aberaeron.